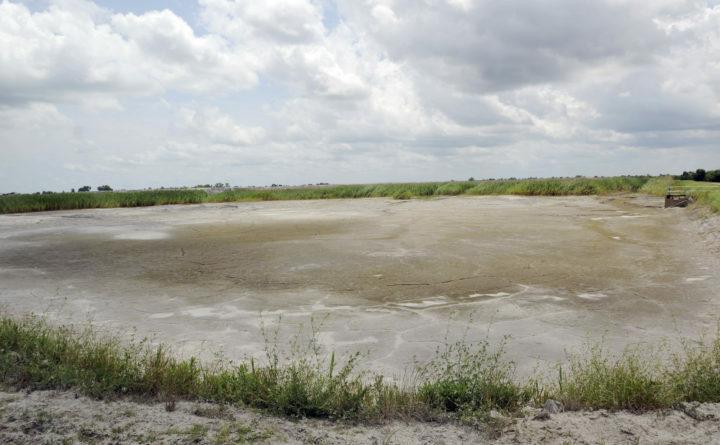 The dried-up bed of an inactive coal ash pond is seen at Duke Energy's Sutton plant in Wilmington, North Carolina, June 23, 2014. Duke Energy says heavy rains from Florence have caused a slope to collapse at a coal ash landfill at a closed power station near the North Carolina coast. Duke spokeswoman Paige Sheehan said Saturday night that about 2,000 cubic yards of ash have been displaced at the L. V. Sutton Power Station outside Wilmington. Duke spokeswoman Paige Sheehan said about 2,000 cubic yards of ash were displaced at the L.V. Sutton Power Station outside Wilmington and that contaminated runoff likely flowed into the plant’s cooling pond. The company has not yet determined whether the weir that drains the lake was open or if contamination may have flowed into the Cape Fear River. That’s roughly enough ash to fill 180 dump trucks. Florence slammed into the North Carolina coast as a large hurricane Friday, dumping nearly three feet of rain and swelling the region’s rivers. The resulting flooding forced swift-water rescues and left several people dead. Duke has been under intense scrutiny for the handling of its coal ash since a drainage pipe collapsed under a waste pit at an old plant in Eden in 2014, triggering a massive spill that coated 70 miles of the Dan River in gray sludge. The Neuse is expected to crest at more than nine feet above flood stage Monday and Sheehan said the company expects the same ash basins are likely to be inundated again. At the W. H. Weatherspoon Power Station near Lumberton, Sheehan said it had already rained more than 30 inches by Saturday evening, causing a nearby swamp to overflow into the plants cooling pond. The Lumber River is expected to crest at more than 11 feet above flood stage Sunday, which would put the floodwaters near the top of the earthen dike containing the plant’s coal ash dump.